It’s funny how some recipes come about. A while ago I created a dish inspired by the Hades/Persephone myth symbolising Persephone being tricked into eating pomegranate seeds. It involved coating individual pomegranate seeds in melted dark chocolate flavoured with rose water. 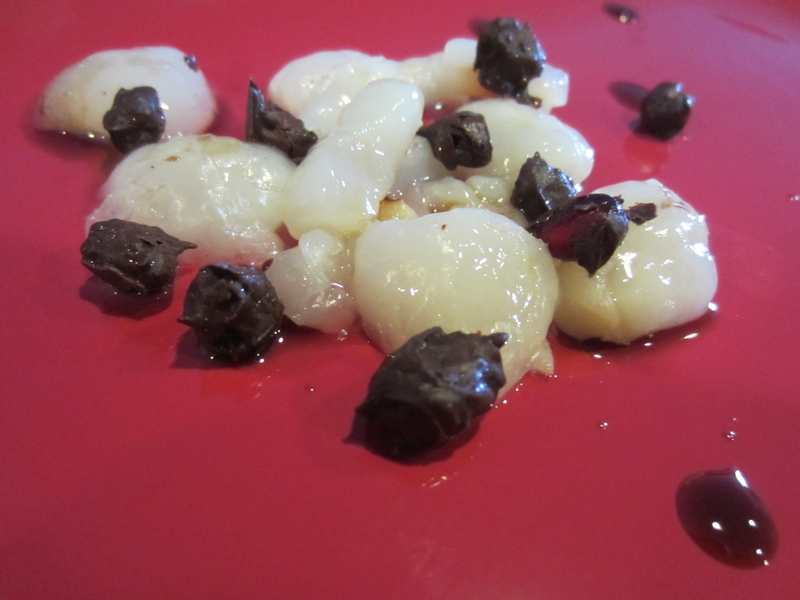 Once the chocolate coated seeds were set, they were served with sliced fresh lychees and dots of pomegranate molasses. Just by looking at the dish you wouldn’t know that it contained pomegranate seeds until you bit into a chocolate and crunched on the fragrant seed. I called the dish Persephone’s Surprise. While watching a cooking show recently I saw a fabulous bright green sago pudding flavoured with pandan extract. I loved the vibrant green colour of the dish but my thoughts went straight to Persephone and pomegranates. I wanted to make that dish but colour it red! I could then add pomegranate seeds and hopefully they would be disguised in the pudding by their shape and colour. I remembered having sago pudding as a child so I researched recipes and thought about ways of making the pudding naturally red. I thought of boiling the sago in pomegranate juice but most of the recipes advised rinsing the sago thoroughly after boiling and I wondered if that would wash away the flavour and the colour. I had a few ideas and as a last resort I was going to use food colouring. I went to my trusted delicatessen and asked if they had sago. They didn’t have sago but they had tapioca pearls. I looked at the packet and saw that the image of cooked tapioca was red! I asked how to get the tapioca pudding red and they said it was a traditional Brazilian recipe which involved boiling the tapioca in red wine. Some more research and I discovered the trick was to cook the tapioca first, drain it and then briefly boil again in red wine. You then marinate it overnight in the wine before draining and briefly chilling. 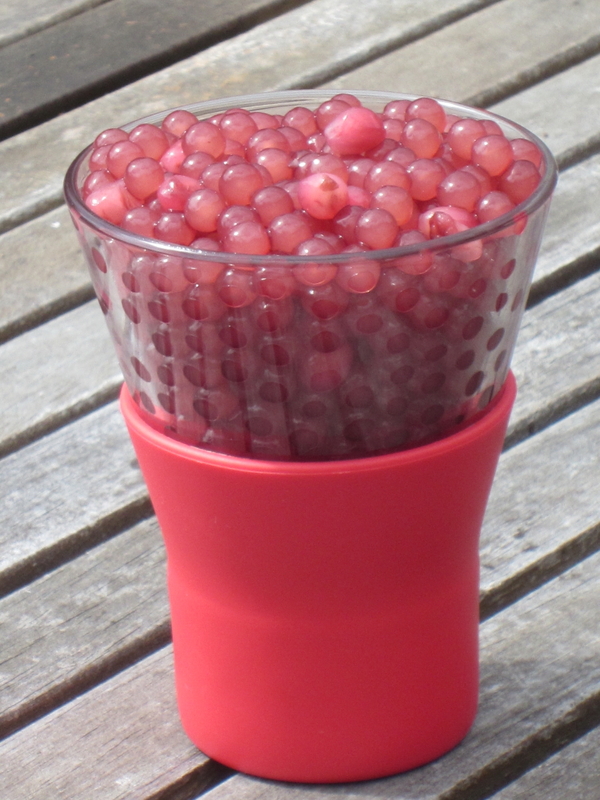 I added my pomegranate tweaks to create a new surprise for Persephone – a Tapioca Surprise. Bring the water to the boil. Add the tapioca pearls. Bring back to the boil while gently stirring the tapioca. Once boiling, cover and remove from heat. Allow to cool for 3 hours, stirring occasionally. Drain tapioca in a colander and rinse under cold water until clear. Add the tapioca pearls, wine, pomegranate juice and sugar to a saucepan. Cover and bring to the boil. Once boiling, remove from heat. Stir through the pomegranate seeds. Allow to cool before placing in a glass or metal bowl. Cover and refrigerate overnight. Drain tapioca and place into a large serving bowl or individual bowls. Cover and refrigerate for 30 minutes. Looks rather interesting the tapioca pearls, if you ever need pomegranates I know a place that would love to give them to you perhaps you know of them already?